Now you can engrave up to three hearts, as well as choose a birthstone for each heart. mums can keep.. Looking for a new ring that shows off the love you have for your children? Then you definitely need ..
Love is in the air with the Swarovski Heart Necklace with Engraving. 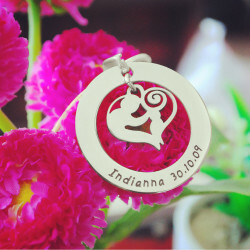 Inscribe the name of the ..
Charms are 0.8cm wide with a 1.2cm drop approx. Chain length is 40cm approx jewellery gifts have a l..
Personalised Family Tree Necklace Mother's Day Gift For Mother. Tastefully display the ones.. Style: Name Necklace/Love Necklace Pendant Size: 2.5cm/0.98" Hook: Single Hook Chain type: Cabl.. Style: Name Necklace/Love Necklace Pendant Size: 3cm /1.2" Hook: Single Hook Chain type: Rolo C..
Show off what family means to you with our beautiful Gifts for Mum - Heart Family Tree Necklac.. Style: Name Necklace Pendant Size: 2.5cm-2.2cm(1"x0.88") Hook: Single Hook Chain type: Cab..
Main Stone: One 2.5mm Round Stone Min Band Width: 2.5mm Max Band Width: 2.8mm.Celebrate motherhood i..
Want to show off your couple status? Check out our Engraved Heart Necklace with Birthstones. Engrave..
Main Stones: Twelve 2mm Round Stones Secondary Stone: One 3mm Round Stone Max Ring Width: 7mm.Fashio..
Everyone is wearing an owl necklace these days because it is the latest fashion trend! Now you can e..
Want to keep your family close by you even when they are afar? Then you will like our Engraved..
Who doesn’t love the new infinity jewellery fashion trend and now with the Engraved Infi..
Keep your family close by your heart always with our lovely Mum's Birthstone Heart Necklac..
Our Mother's Day jewellery is super popular and this necklace for Mum is perfect! If you are loo.. Mother's jewellery never looked as good as the Silver Birthstone Necklace for Mum . Any mu..
Material: Sterling Silver 0.925 Style: Love Collection Thickness: 1.2mm Measurements: 20mm x 20mm&nb.. This fashionable Sterling Silver custom Jewellery can be engraved with all the names of ..
Our Personalised Initial Charm Necklace allows up to 5 personal and unique discs to be p..
Main Stones: Two 2.5mm Round Stones Accent Stones: Six 1.25mm Round Stones Band Width: Min: 1.8mmMax.. Style: Heart Necklace Pendant Size: 2.5CM(1.0")X2.2CM(0.88") Hook: Single Hook Chain type:..
Get all the names of those you hold close to you personalised on this beautiful and delicately made&..
We now have the latest fashion trend available for you in a fun and flashy way - the Sterling ..
Make a statement with this Extra-Large Monogram Necklace! The pendant measures over 2 inch..
For moms looking for the best way to express their love for their family, there is no better way to ..
Pendant Size: 1.3*2CM(0.52*0.8") Hook: Single Hook Chain type: Cable Chain Material: 925 Silver.. The bond between a mother and her daughter is a very special one that cannot be broken. Show this be..
Let mum keep her children close to her heart. Present mum or grandma with a personalised necklace ma..
Show your family in a beautiful way with the Sterling Silver Layered Grandma Jewellery . This ..
Family means everything, so show it off with this Silver Family Tree necklace . This necklace ..